In 1973, Dennis Nichols began his career as an officer for the Pryor Police Department. He remained a dedicated employee and servant to the City of Pryor Creek until he retired temporarily in May of 2015. He eventually returned to the office of Chief of Police in February 2016. In 1987, Dennis had already built what most would consider a successful career - having worked patrol and investigations extensively by that time. With then-Chief Wiley Backwater retiring, Dennis decided to run for Chief of Police. His successful bid would lead to a career of over 28 years as the Chief of Police for Pryor Creek. Dennis is known by colleagues and employees as a level-headed leader whose compassion for his community could be seldom matched. Dennis's leadership, compassion, and dedication are virtues that he shares and teaches as often as possible. Assistant Chief James Willyard joined the Pryor Police Department in 2002. Willyard has worked in the capacities of Patrolman, Detective, Sergeant over Detective Division, and most recently Captain. In that timeframe, Willyard has completed hundreds of investigations, resulting in an impressive number of arrests. For several years, Willyard was also working with the United States Marshal Service with their Northern Oklahoma Violent Crimes Task Force. Willyard has taken an active role in helping shape the landscape of training for officers, utilizing his experience in the field to educate officers on safer day-to-day practices. He is excited for the opportunity to help lead our officers. 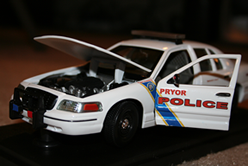 Captain Kevin Tramel has been employed with the Pryor Police Department since 1998. Since that time, Capt. Tramel has also served in the capacities of Patrolman, Corporal, Sergeant, Jail Administrator, Dispatch Supervisor. Captain Tramel has worked dilligently with Chief Nichols and Asst. Chief Willyard to procure funds and plans to improve officer training and equipment opportunities.